Melanie is a very special girl. She is the smartest in her class, and is always trying to please her favorite teacher, Miss Justineau. Melanie is always very careful to follow the rules. Every day when the soldiers come to her cell, she makes sure to sit very carefully as they strap her arms and legs onto a wheelchair and cover her face with a plastic mask. As one soldier aims his gun steadily at her face, she jokes and says she doesn’t bite. No one laughs. No one laughs much anymore; not with the hungries prowling around outside of the army base where Melanie lives. Then she gets to attend class with Miss Justineau and the other children, all of whom are bound into their own wheelchairs. Miss Justineau says Melanie is a genius. Melanie loves to tell Miss Justineau about all the wonderful things she’ll see and do after she grows up. She doesn’t understand why this always makes her beloved teacher look so very sad. Of all the ghosts, ghouls, and monsters that can be found in horror novels and movies, zombies tend to be very hit or miss. The majority of zombie fiction is overly gory, with soulless villains that cannot think or feel or be understood and are therefore not terribly interesting. The ones that transcend the genre, novels like Mira Grant’s Feed or Max Brooks’ World War Z, choose to focus less on the walking dead and more on the people who are struggling to survive in a world where they are no longer the apex predators. The Girl With All the Gifts, like the aforementioned books, tells a very human story in the middle of an inhuman world. It combines the hard medical science of Grant with the intensely personal stories of Brooks to create something unique and fantastic. This is a novel in which each of the characters has their own struggles and victories, flaws and strengths. The young schoolteacher finds herself doubting her own judgement when it comes to the fate of her students. The scarred and surly army sergeant is forced to confront his long-held biases about the world he lives in. Even the mad-scientist, who has sacrificed her own moral compass in her desperate journey to find answers, is relatable. By focusing on a small group of compelling individuals, author M. R. Carey is able to make the zombie apocalypse a more personal story. As the leading protagonist, Melanie is a triumph. She is young and naive, hopeful and eager and engaging. She is smart and resourceful, but at the same time she’s a scared little girl who is struggling to understand the world around her. Carey walks a tight edge and risks making Melanie a little too perfect, but in the end she is just as fallible as everyone else and her motivations are often alien to the adults around her. I won’t say too much about the overall plot, as experiencing it for the first time was half the fun. Melanie and the others are living on a protected army base approximately sometime after the majority of the population as succumbed to the “zombie” pandemic. The stumbling, rotting, and forever hungry remnants of the human race aren’t reanimated corpses, but are instead the victims of a type of fungal infection. The scientific explanation behind the hungries was one of my favorite aspects of this novel, as I had heard of this terrifying phenomenon taking place in the animal world and could readily imagine the destruction it could cause if it ever found a way to infect mammals. I’ve been rather disappointed by thrillers lately, but The Girl With All the Gifts went a long way towards restoring my faith. This novel is exciting, suspenseful, and tightly written. It never lags for a second once the plot is set in motion. And it tells a story about what it truly means to be human, and humane, in a world where humanity has become endangered. 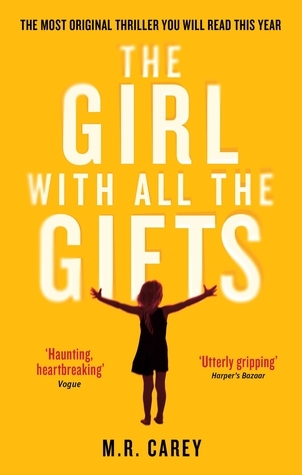 You can find The Girl With All the Gifts here on Amazon or here on Book Depository.